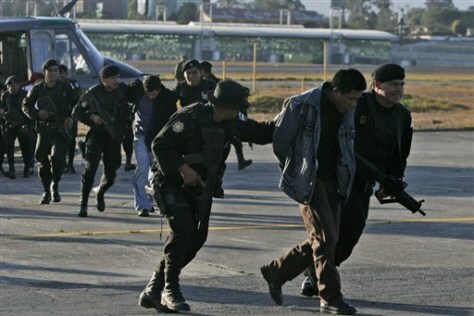 Guatemalan police lead suspected gunmen Domingo Choj, right, and Hector Rolando Toj, back, at an air force base in Guatemala City on March 9. Nine suspected gunmen were arrested after hours of fighting in western Guatemala. One was a Mexican national and suspected of being a recruiter for the Zetas, a group of Mexican cartel hit men.